Whether you make music, mix music, or listen to music, headphones are an excellent tool for both personal and professional use. There are many different models of mixing and recording headphones available, each with different strengths and weaknesses. Also, there are several individual brands to choose from. AKG is a longstanding and internationally renowned name in the professional audio field, offering innovative products including microphones, wireless systems, and, of course, headphones. The AKG K 240 Semi-Open Studio Headphones are popular and affordable, offering a stylish design with many advanced features. Read on to learn if these headphones could be the right choice for you. Before purchasing a pair of headphones, ensure that your selection is the best fit for you. Headphones for mixing and recording come in one of three main types: closed-back, open-back, or semi-open. Closed-back models block out all background noise and prevent others from hearing what you are listening to. Open-back options are the opposite; all sound leaks out and mixes with the sound around you. Closed-back is more private and better for recording purposes, while open-back allows for a larger quality of sound and is better for mixing. Semi-open headphones are a cross between the other two types; some, but not all, sound leaks out from the earcups. This grants more privacy than is possible with open-back option, but a more desirable quality of sound than is found with closed-back models. The type of earcup that is right for you depends on your specific needs. You should also consider durability. To increase the lifespan of headphones, many manufacturers include replaceable parts. Some devices are foldable to decrease the possibility of damage in transport or storage. Generally, abundant positive customer reviews and a trusted brand name are good indicators that a product will be reliable. Comfort is critical for headphone use, especially for audio professionals at work for several hours a day. Top-quality padding in the earcups and headband decrease uncomfortable pressure on your skull. Also, some headphones are also adjustable to achieve a snug fit. If you will be using your headphones for single-ear monitoring, make sure that the structure is built for convenient one-ear use. The AKG K 240 Semi-Open Studio Headphones are a highly recommended product. The semi-open design is coupled with circumaural earcups for comfort and an open quality of sound. This headphone model from AKG is an updated version of the AKG K 240 Monitor. With this amended version comes an extended dynamic range as well as heightened sensitivity. These effects are achieved with the advanced XXL transducers; their increased size allows for large, realistic audio. 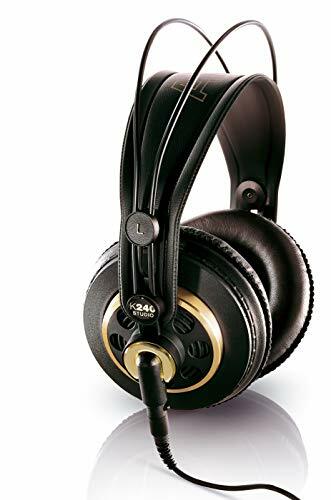 These professional-grade headphones are capable of producing clear, high-quality sound with low-level output sources such as computers, portable CD or DAT players, and minidiscs. So, you get exceptional audio no matter what device you are listening from. The K 240 Studio’s structure features an adjustable headband to achieve the perfect fit. A strong yet flexible steel frame enables this adjustability without any action required by the user. Also, the headband is built to resist twisting and are durable enough to last throughout travel and onstage use. You can even use the K 240 Studios for single ear listening. These headphones from AKG come with a 3 m OFC screw-type cable that is detachable and replaceable. It is constructed of 99.99% oxygen-free copper and includes plugs on both ends that are plated in gold. The AKG K 240 Semi-Open Studio Headphones offer a selection of great features that are not found in many other products. The semi-open design combines the benefits of open and closed-back headphones for a wholly unique listening experience. You can enjoy the realistic sound quality of an open structure along with the comfort and privacy of closed models. The downside to this set-up is that the user does not enjoy complete sound isolation, as some sound is still audible to those around you, and the sound quality is not as large as with open models. However, extra-large transducers, which are new with this model from AKG, create an exceptionally detailed and open audio projection, making the sound quality of a high caliber. The K 240s provide comfort even after hours of use; the semi-open design reduces the risk of ear fatigue. An excellent fit is ensured with the self-adjusting headband, which requires no repositioning and does not twist. Additionally, the earcups have been crafted with a gimbal-like suspension that keeps the earcups in place without pressing down on your ears. AKG has manufactured these headphones to last even throughout onstage use or transportation. Also, the included input cable is detachable, so you can replace it if need be. These headphones also offer great versatility, with the capability for single-ear use and connection to low-level output sources. While a fantastic product, the K 240s have some downsides. Although the device is built with durability in mind, the structure does not fold, which may prove more difficult to store or travel with. Also, the semi-open design may not offer the features some are seeking in a pair of headphones, as mentioned above. These negatives are minor, however, and are largely made up for by the sweeping positive aspects of the K 240s. For the price, these headphones are an exceptional value for money. If you need an audio interface to go with a set of headphones, be sure to check out our dedicated buying guide. There are so many headphones available on the market today that many devices can seem impossible to tell apart. The AKG K 240 Semi-Open Studio Headphones stand apart from the rest with a modern, meticulously designed structure and a range of uncommon features. If you are looking for a one-of-a-kind pair of headphones, the K 240s could be perfect for you.